This is a guest post by Sarah Mwangi, the Kenyan coordinator at one of our Medical Partners, African Mission Healthcare Foundation. Sarah is responsible for identifying patients at AMHF’s hospitals and walking them through the Watsi process. She’s made it possible for more than 240 people in Kenya, Tanzania, and Ethiopia to access medical care funded by Watsi donors. It’s Monday Morning. Yeah. Those Monday mornings that need all the will in the world just to open your eyes, drag yourself out of bed, get showered and dressed. Then off to work. Yeah. Work. Where is that holiday when you need it?! Leaders at the ICC, internal politics, terrorist attacks…Yeah, I definitely need a holiday. I grab my mug of coffee and head out, still trying to convince myself that there are tons of reasons to be cheerful this Monday morning. Monday. My most challenging day of the week. And yet somehow, God still manages to surprise me. When I get to my desk, I decide to finish some filing then start going through profiles from our different partners to hand in to Watsi. Then, Monday instantly changes for me. I look at the picture of the girl who said this to our Watsi representative in Tanzania. She is only 12 years old. Abandoned by her parents when she was only 9 and now under the care of her grandmother. My eyes tear. I read the sentence about her wishes and her dreams over and over. It doesn’t help though because the tears now can’t be stopped. What will my boss say?! I pretend that there’s something in my eye as I gaze upon her photo. Her smile is so bright. I try to imagine what her childhood was like. How it must feel to be abandoned by her parents, especially in this African context. And now: she has been living with contractures from a burn that make it difficult for her to go to school. As I type in her story to submit to Watsi, I think of all the people who make sacrifices, when they get onto the Watsi website, just to help people like Agness. I wonder if they know just how much they are making a difference in peoples’ lives; if they know that every penny they contribute reaches these beautiful people. In the midst of reading stories like Agness’, wiping my tears and typing away, I forget that it’s Monday. I forget how slow Mondays can be; how mundane; how insane. Somehow my Monday is made worth it. 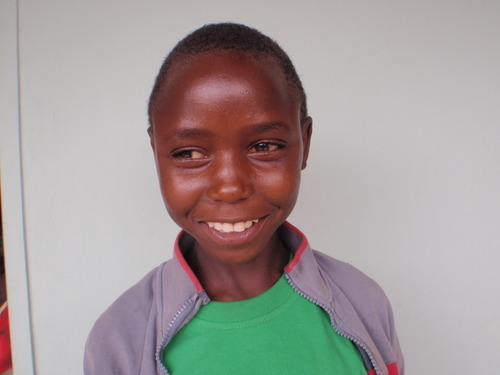 Agness, the patient in this post, was fully funded on Watsi in less than 24 hours.